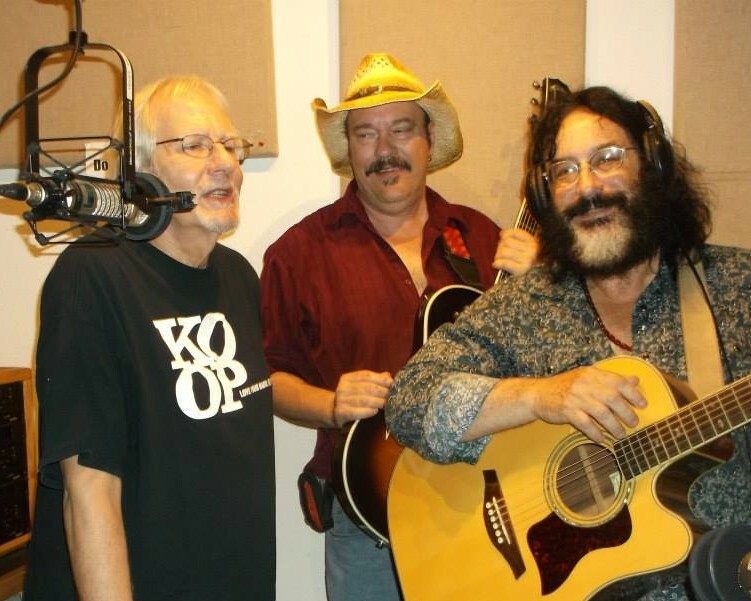 Rag Radio’s Thorne Dreyer, left, with Billy Bourbon and Guy Schwartz in the studios of KOOP-FM in Austin, Texas, July 5, 2013. Photo by Marlo Blue / The Rag Blog. Houston’s Guy Schwartz — whose bands have included Relayer, Z-Rocks, the New Jack Hippies, and the Austin-based Guy Schwartz & the Affordables — was called the ‘Godfather of the local music scene’ by the Houston Press. See video of the show below. 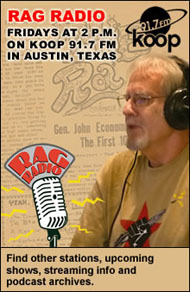 Houston rock and blues musician Guy Schwartz was Thorne Dreyer’s guest — in interview and performance — on Rag Radio, Friday, July 5, 2013. Schwartz was joined on the show by Marlo Blue of Houston’s KPFT-FM and was backed by musicians Billy Bourbon, Roger Tausz, and Rick Lyon. 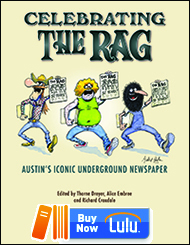 Rag Radio is a syndicated radio program produced at the studios of KOOP 91.7-FM, a cooperatively-run all-volunteer community radio station in Austin, Texas. Guy Schwartz is a musician, songwriter, producer, videographer, music journalist and archivist, and a political activist. In his appearance on Rag Radio, he is backed on rhythm guitar and vocals by singer-songwriter and bandleader Billy Bourbon (The Billy Bourbon Band) who also plays guitar in Guy’s Austin-based Affordables, bassist Roger Tausz of the New Jack Hippies, and percussionist Rick Lyon. Also featured on the show is Schwartz collaborator Marlo Blue, an audio-video producer and a news anchor at KPFT-FM in Houston. Guy Schwartz has played with music legends ranging from Lightnin’ Hopkins and B.W. Stevenson to Lionel Hampton and The Monkees. and his groups have included the progressive underground band, Relayer, formed in 1977; the power-pop band Z-Rocks, started in 1980; the New Jack Hippies, which toured the U.S. and Western Europe from 1999-2004 and still perform regionally in Texas; and the Austin-based Guy Schwartz and the Affordables. Schwartz also produces a cable-television show on Texas music and musicians, and is producer and creator — with Marlo Blue — of the annual Houston indie music and video festival, South By Due East. Schwartz and Billy Bourbon recently recorded the album, Weed at Walmart. Guy Schwartz and crew on Rag Radio, Friday, July 5, 2013. Video by Guy Schwartz and Marlo Blue. 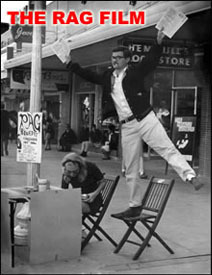 Rag Radio is hosted and produced by Rag Blog editor and long-time alternative journalist Thorne Dreyer, a pioneer of the Sixties underground press movement. The show has aired since September 2009 on KOOP 91.7-FM, an all-volunteer cooperatively-run community radio station in Austin, Texas. Rag Radio is broadcast live every Friday from 2-3 p.m. (CDT) on KOOP and is rebroadcast on Sundays at 10 a.m. (EDT) on WFTE, 90.3-FM in Mt. Cobb, PA, and 105.7-FM in Scranton, PA.
Rag Radio is produced in association with The Rag Blog, a progressive Internet newsmagazine, and the New Journalism Project, a Texas 501(c)(3) nonprofit corporation. Tracey Schulz is the show’s engineer and co-producer. THIS FRIDAY, July 19, 2013: Sociologist, media critic, and author Todd Gitlin. 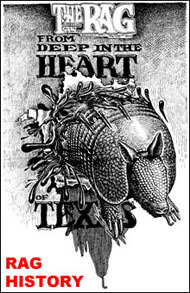 This entry was posted in RagBlog and tagged Afordables, Billy Bourbon, Guy Schwartz, Houston Music Scene, Interview, Marlo Blue, Music History, New Jack Hippies, Podcast, Rag Radio, Texas Musicians, Thorne Dreyer. Bookmark the permalink.